An EDO typically represents a U.S. state, territory, region, tribe and/or locality that conducts economic development activities in support of their community. All EDOs must apply and be approved by SelectUSA to receive EDO exhibitor designation and pricing at the Investment Summit. The Exhibition Hall at the SelectUSA Investment Summit is the premier opportunity for U.S. state, territorial, tribal, regional, and local EDOs to share opportunities directly with international investors. An EDO wishing to amplify their presence at the Investment Summit may also participate as a sponsor. We welcome participation in the Exhibition Hall from service providers and other associations or organizations. A service provider is a company that advises or facilitates a firm’s investment decisions, such as attorneys, consultants, tax professionals, site selectors, etc. A trade/business association that facilitates investment may also participate as an exhibitor or sponsor. Approved organizations may purchase an exhibit booth within the Exhibition Hall. The purchase price of a booth is different for EDOs and non-EDOs and is listed within the pricing section below. Organizations may select to gain amplified exposure outside of an exhibition booth through sponsorships. 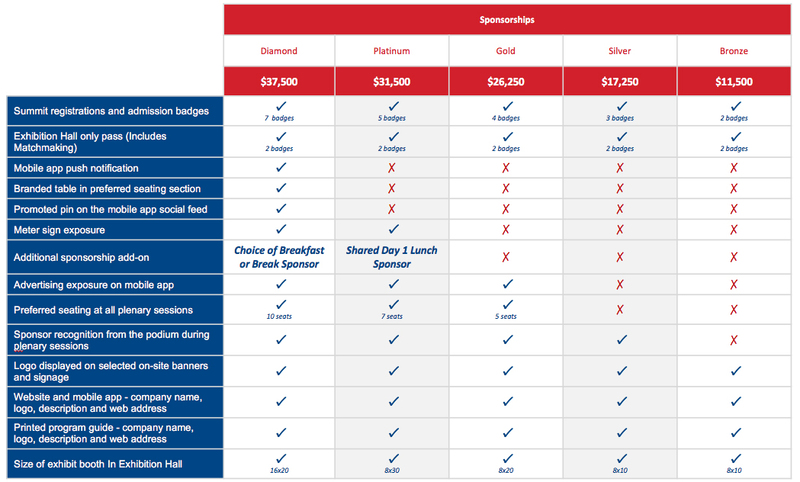 Sponsorship includes diamond, gold, silver and bronze levels, which include exhibit booths and additional full conference passes. Please see sponsor offerings below. Applicants who have applied and received confirmation of acceptance may proceed to step 2. Once an exhibitor or sponsor has received confirmation of acceptance by SelectUSA, event management will reach out to the contact on file to confirm participation with an exhibition or sponsorship contract. Each exhibiting or sponsoring organization must complete a contract to counter-accept the offer to participate. You should be contacted within 15 business days of submitting your initial application. Once a contract is signed, the organization’s point of contact will receive a link to their exhibitor or sponsor portal which will contain information regarding their participation. Information in the portal includes the exhibitor kit, link to register personnel, invoice, payment options, etc. Exhibitors and sponsors will also be able to upload their logo and organization description through this portal. Exhibitor portals will be available starting in December 2018.
Review the Resources for Exhibitors and Sponsors page on this website for details about exhibiting and sponsoring. All personnel should apply via the attendee registration link. The portal listed above will contain comp codes to register any complementary exhibitor or sponsor staff (please note that an application must be completed and vetted for each person who will be attending the Investment Summit). Codes will be included for the two Exhibition Hall-only personnel included with your booth, as well as any tickets included with a sponsorship package. Additional personnel passes are available at the full conference rate. All personnel must go through the application and vetting process to receive a badge. If you would like to register more than one person at a time, simply click on the “Register Another” button at the end of each individual application. When individuals are registered via one account in this manner, the account holder has access to the application status of all associated personnel. IMPORTANT: Please do not call the hotel directly to book rooms for Investment Summit participants. SelectUSA is managing the hotel room booking process for all attendees through the registration system. Once an attendee has applied and been approved to participate, they will receive an email link to book their hotel room. If you would like to make hotel reservations for more than one person, simply select the number of hotel rooms you would like to book and indicate who will be staying in each room. Hotel Reservations will open in November 2018. All approved registrants may participate in the matchmaking system. Once a participant has been approved, they will receive an email with details on the matchmaking process. The matchmaking system will launch in Spring 2019. All exhibitors receive two Exhibition Hall access passes for booth personnel per booth (regardless of booth size). Exhibition Hall access passes include access to the matchmaking system. 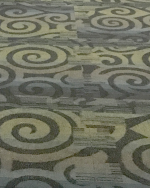 - Columbia Hall’s carpet is a multi-colored green-blue pattern. 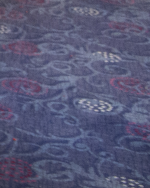 - International Terrace Foyer’s carpet is a multi-colored pattern with blue and red. Exhibitors have the option to offer food and beverages in their booth during the evening reception in the Exhibition Hall. See rules and regulations regarding food and beverages on the “Resources for Exhibitors and Sponsors” page. Please see the Sponsor and Exhibitor Prospectus for additional sponsorship opportunities that do not include a booth in the Exhibition Hall.